Automated retrieval and updates of IP Defense policies from ThreatSTOP’s systems to the ISR. Automated collection and upload of log files from the ISR to ThreatSTOP’s systems. The integration is performed by a Linux-based virtual machine provided by ThreatSTOP, named ThreatSTOP Centralized Manager (TSCM). After its initial installation, the TSCM will retrieve the list of subnets matching the policy configured via the ThreatSTOP Admin portal and update the ISR using an SSH connection. Optionally, the ISR can be configured to send the connection log events to the TSCM via syslog and the TSCM will package and upload log files to ThreatSTOP’s Portal, for analysis and reporting. 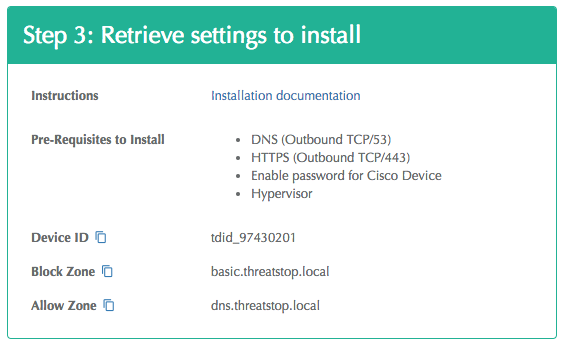 This document provides the steps using the Command Line-based installation of ThreatSTOP. Using the Command Line method, device settings are configured on the command line. 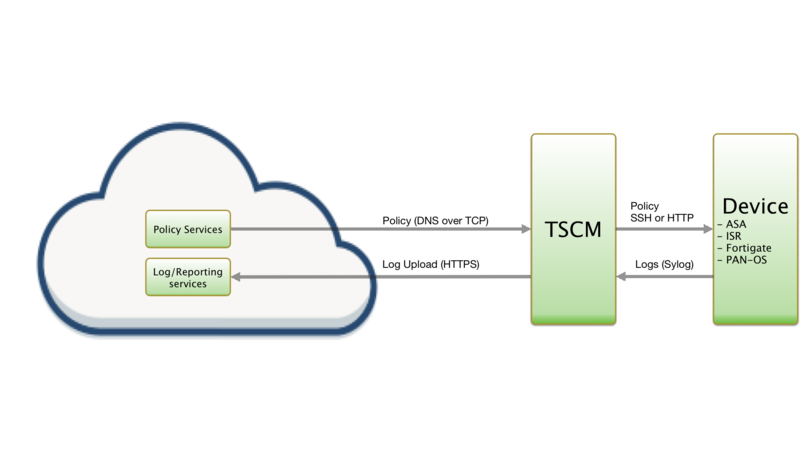 The initial configuration and future changes must be done using the TSCM CLI. Changes to the policy assignment must be done on both the portal and TSCM CLI. For the Web-based installation, please read this document instead. The current version of TSCM is compatible with all ISR devices and IOS versions. It is also compatible with IOS/XE. The Maximum Policy Size is the maximum number of ACLs that your device can support. It depends on the hardware and memory available on the device. Please contact your Cisco reseller to find out the capacity of your device. To perform this installation, you need an account reachable via SSH on the ISR as well as the Enable password for the device. During this step, you will create a device entry on the Admin Portal. You will select a device type (Cisco ISR) and enter the configuration settings. A minimum configuration only requires a handful of settings but optional, advanced options are also available. Public IP address: In static mode, this is the public IP address of the device. It is possible to configure multiple device entries with the same public IP address. Domain name: In Dynamic mode, this is a DNS FQDN which must be kept up-to-date as an A record pointing to the device’s dynamic IP. The authenticity of host '<ip address>' can't be established. ECDSA key fingerprint is SHA256:UW05wRgAblpwjfObj4ZklSYfau8PnoE1GXXuSCO5Zfs. Device Management IP address: This is the internal address of the device. The TSCM will communicate with the ISR via SSH using this IP address. Object Group Name (Block List): the name of the Object Group that the TSCM will use to store the subnets in the Block List generated by your Policy. The default is threatstop-block. Object Group Name (Allow List): the name of the Object Group that the TSCM will use to store the subnets in the Allow List (whitelist) generated by your Policy. The default is threatstop-allow. Max entries per object group (Maximum Policy Size): select the highest number of ACLs supported by your ISR. If the policy becomes larger than this setting, the TSCM will truncate it down to the Maximum Policy Size. Additional syslog source IP(s): Typically, logs will sent over syslog by the device itself. If logs are sent by another IP address (for example, after being processed by a SIEM, or in High-Availability configurations), that IP address should be configured in this field. Custom password prompt: if you have customized the ISR configuration to change the ssh password prompt (username@ip_address’s password:), you can configure the value that the TSCM should look for when connecting to the ISR. Compress Configuration: compress the system configuration when saving it to the device’s flash memory. Useful for large policies where the uncompressed config might not fit on the flash memory of smaller device. See Cisco’s documentation. Set to Compress/Uncompress to compress/uncompress the configuration (regardless of the current setting) or set to Leave untouched to keep the device’s current setting. From this point on, the TSCM will retrieve policy data (IP subnets) and configure them on the ISR, every hour. This will create (if not already created) and populate the two Object Groups defined in the device settings. The output should contain the threatstop-allow and threatstop-block groups. Note: Alternatively, you could create a single access-list (e.g. TS-in), and apply it to all relevant interfaces. You can test that the policy is correctly applied by pinging bad.threatstop.com (64.87.3.133) through the device, a test IP included in all policies. The ping command should fail. After applying the ACLs, generate log entries by trying to reach our test address through the device. The command should fail to connect. If no log file is present, check the syslog forwarding configuration on the device and check that the ACL is applied. Note: A single TSCM image can manage multiple ISR devices (as well as Cisco ASA, Fortigate Fortinet and Palo Alto Networks PAN-OS devices). Simply repeat the device entry creation (step 1), skip the download and VM install (step 2) and link the additional device(s) by repeating step 3. No additional configuration is required to support High-Availability configurations for IOS and IOS/XE routers and switches. If you change the credentials on the ISR device, you will need to run tsadmin configure <device name> and update them on TSCM to allow the virtual machine to continue to connect. The configure command also supports the –advanced option enable the advanced settings described in the configuration section of this document. To disable the integration, the first step is the deletion of the device on the TSCM. This will stop any policy updates or changes to the ISR device. the policy is not available yet. It typically takes 15 minutes for new devices and new policies to be activated in the Policy Service. If tsadmin add fails to connect to the device, check the credentials (username, password and enable password). If they are correct, check if the ssh password prompt has been changed from Cisco’s defaults (Password:).